The reason it makes us all laugh is because I say that about TONS of things. Here are some of the things I hated or would never have eaten before starting my cooking adventures: avocados, guacamole, kale, quinoa, cilantro, curry, gluten free flours, mango, and black beans. And not only am I cooking with and/or eating these things now, but I am absolutely loving them! 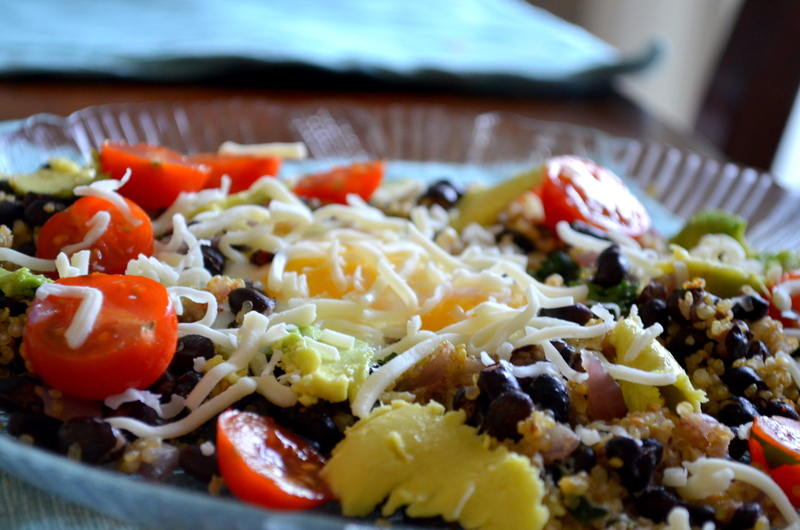 This week I have particularly been hooked on black beans….they are so good and so filling! I think I was craving them this morning and decided to do a little experimenting! I can honestly say I have never had beans for breakfast, at least not to my recollection. I now know I was totally missing out! Drain and rinse the black beans, measuring them out. Dice your onions and chop your cilantro into smaller pieces. Wash the kale and rip it into small pieces. 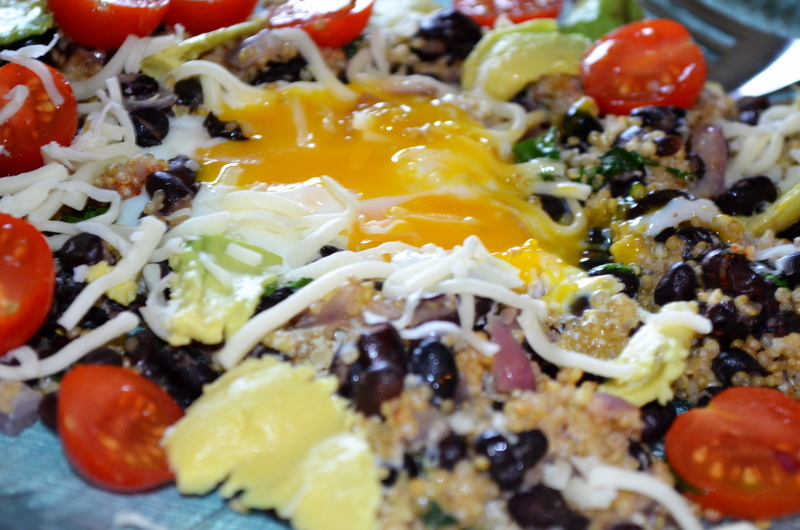 Put 1 tsp olive oil in a large skillet, adding in everything but the eggs and cheese. Saute for a bit. 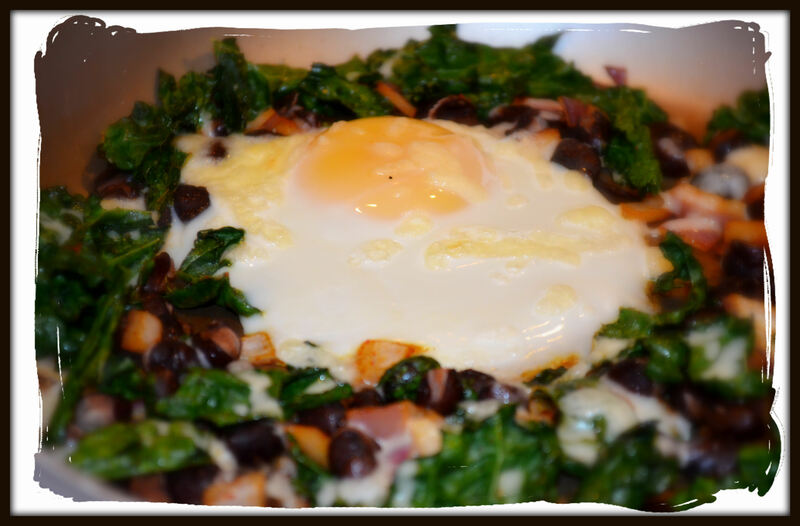 When onions look sauteed and the kale cooked, add in the eggs. Be careful not to break the yokes. Add the cheese and sprinkle over the entire dish. Turn your oven onto Broil. Unless your pan can tolerate the high heat, leave the door open and your handle out as you broil the dish for about 2 minutes. Make sure you use a skillet that is safe to do this with, and be careful that the handle doesn’t get too hot. You may need to grab it with a pot holder, even though it has been outside the oven.